Monique Gabriela Curnen (born September 7, 1970) is an American film and television actress. Curnen's mother is from Puerto Rico, and her father is of German and Irish descent. She grew up in Framingham, Massachusetts and went to Williams College, where she concentrated on other studies. After college, she spent a year (1992–93) as a full-time intern at Unity House, the Minority Cultural Center, at Connecticut College in New London. She then moved to New York and started taking acting classes and going to auditions. 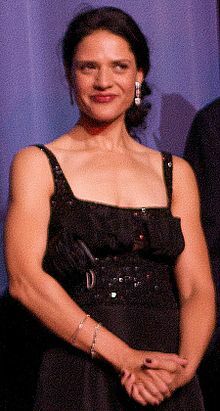 Curnen has appeared in several films including Bollywood Calling (2001), Half Nelson (2006) and The Dark Knight (2008), in which she played rookie Detective Anna Ramirez. She also played the colleague of Paul Walker's chacterue Brian O'Connor in Fast & Furious (2009) in a cameo. She has also appeared in numerous television series including Dexter (in the season 1 episodes "Let's Give the Boy a Hand" and "Love American Style"), House M.D. (in the episode "House Training", 2007) and Law & Order: Special Victims Unit (in the episode "Quickie", 2010). She played Detective Allison Beaumont in the 2009 police procedural drama series The Unusuals. She has appeared on the TV series Sons of Anarchy, playing Amelia Dominguez. She appeared in the season finale of Season 2 of Lie to Me ("Black and White", 2010) as Detective Sharon Wallowski, whom she continued to play in Season 3 in a major recurring role. She appeared in a 2014 episode of the TV Series Person of Interest as Precinct Captain Moreno, and two episodes in Season 4 of the TV Series Elementary as Detective Gina Cortes.The Mentalist (Tamsin Wade in the fifth season) . 2006 Dexter Yelina Episode: "Let's Give the Boy a Hand", "Love American Style"
2007 House M.D. Lupe Episode: "House Training"
2009 The Unusuals Detective Allison Beaumont Main role. 2010 Law & Order: Special Victims Unit Episode "Quickie"
2010–2011 Lie to Me Detective Sharon Wallowski Recurring seasons 2-3. ^ "County Fare: On International Women's Day, a look at Berkshire-based women making their mark". The Berkshire Eagle. Retrieved 2018-01-22. ^ Quintala, Lisa (August 20, 2008). "Monique Curnen, una hispana en Cuidad Gótica" Archived January 4, 2011, at the Wayback Machine, People en Español (in Spanish). ^ Wightman, Catriona (July 22, 2010). "Monique Curnen lands Lie to Me role", Digital Spy. ^ CBS Press Release (January 19, 2016). "Holmes & Watson must search for a killer...", CBS Press Express. Wikimedia Commons has media related to Monique Gabriela Curnen.